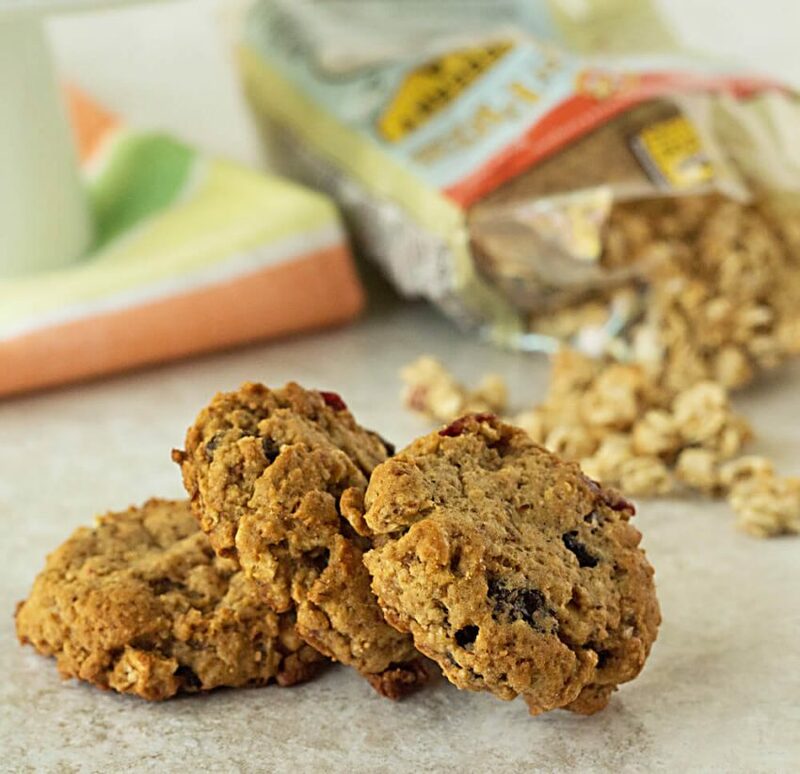 Gluten free granola breakfast cookies are a sure fire cure for the gluten allergy blues. They’re healthy oatmeal cookies that are sweet, crunchy, and loaded with gluten free apple blueberry granola. 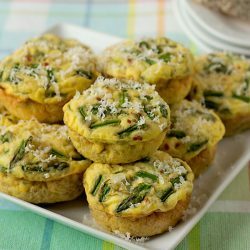 Perfect for eating as breakfast cookies or as a healthy snack any time! *Disclosure: Thanks to Bob’s Red Mill for sending me a free sample of their gluten free apple-blueberry granola to try. I was under no obligation to use it in a recipe, or to post about it, but I couldn’t wait to dig in and develop this amazing gluten free cookie recipe with it! All thoughts and opinions are my own. Gluten free granola doesn’t have to be dry and tasteless. 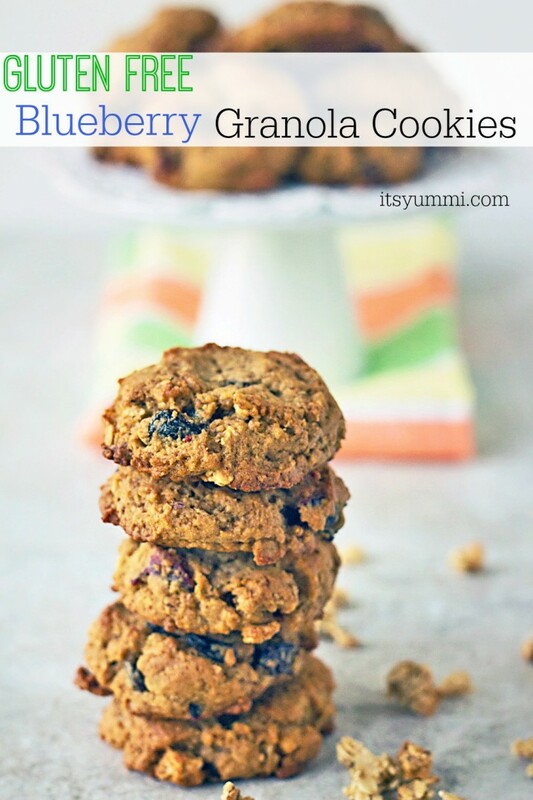 My recipe for gluten free granola breakfast cookies recipe is proof of that! I think most of you know that I’ve been trying to eat foods lower in carbs. What I haven’t had to do is cut gluten from my diet. Fortunately, I don’t have Celiac Disease, nor do I have a gluten intolerance, but many of you do, so I want to create recipes that you’ll be able to enjoy. 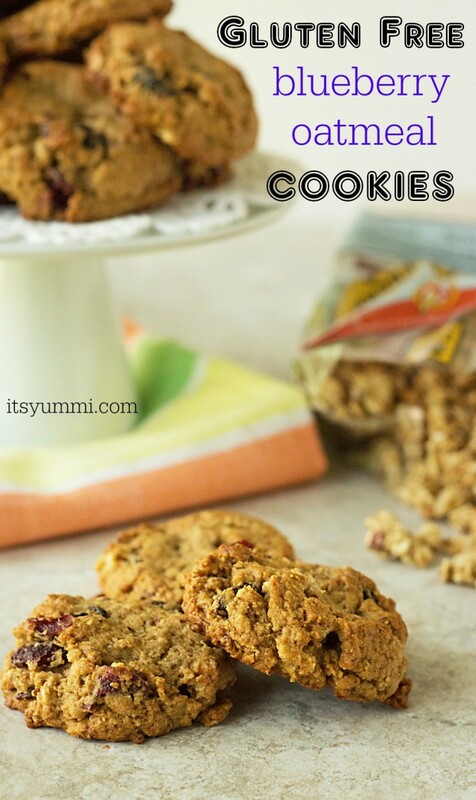 These gluten free granola oatmeal cookies are definitely enjoyable, even if you don’t need or want to cut the gluten from your diet. Celiac disease is a condition that damages the lining of the small intestine and prevents it from absorbing parts of food that are important for staying healthy. The damage is due to a reaction to eating gluten, which is found in wheat, barley, rye, and possibly oats. You can learn more about it HERE. 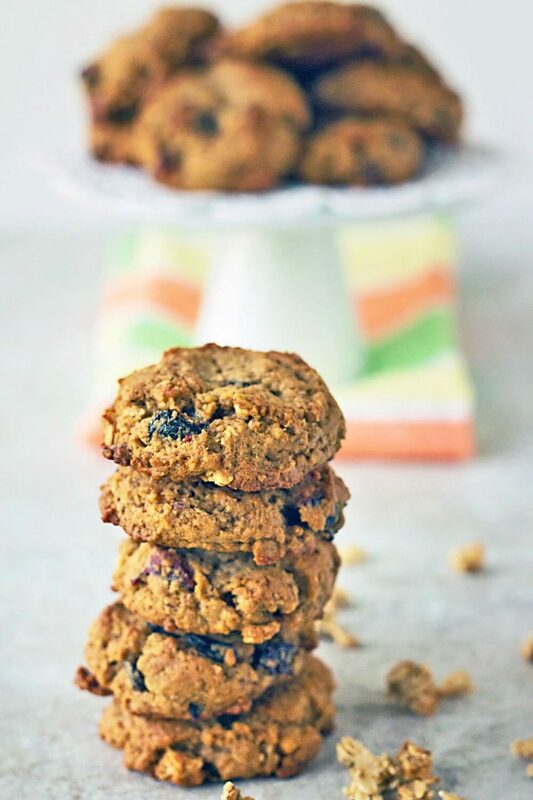 There are 2 ways to make these healthy granola cookies, and both are equally delicious. 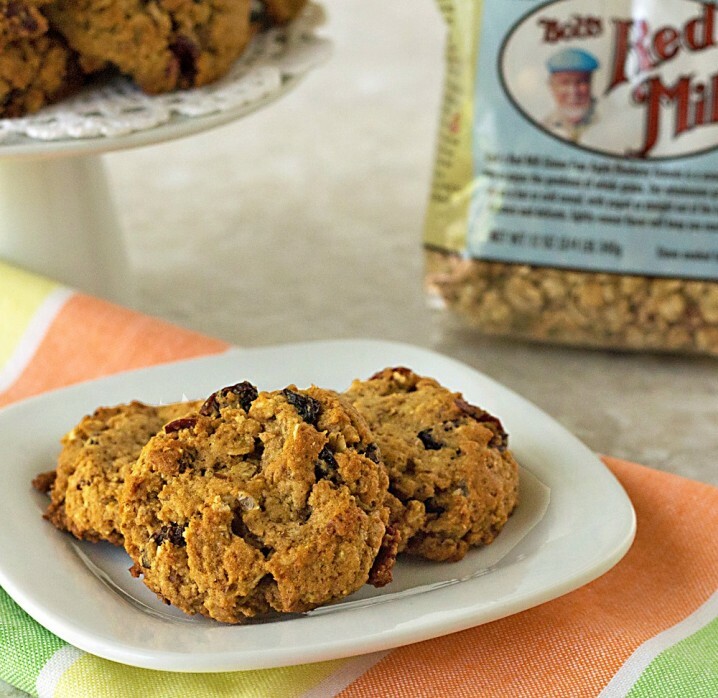 Because Bob’s Red Mill has such a great selection of gluten free products, the absolute easiest, no fuss way to make these cookies is to buy bags of their gluten free chocolate chip cookie mix and their gluten free apple blueberry granola. There’s a recipe right on the side of the chocolate chip cookie mix bag that’ll walk you through how to make them. All you’ll need to do is stir a cup of the granola into the dough before you scoop and bake them. 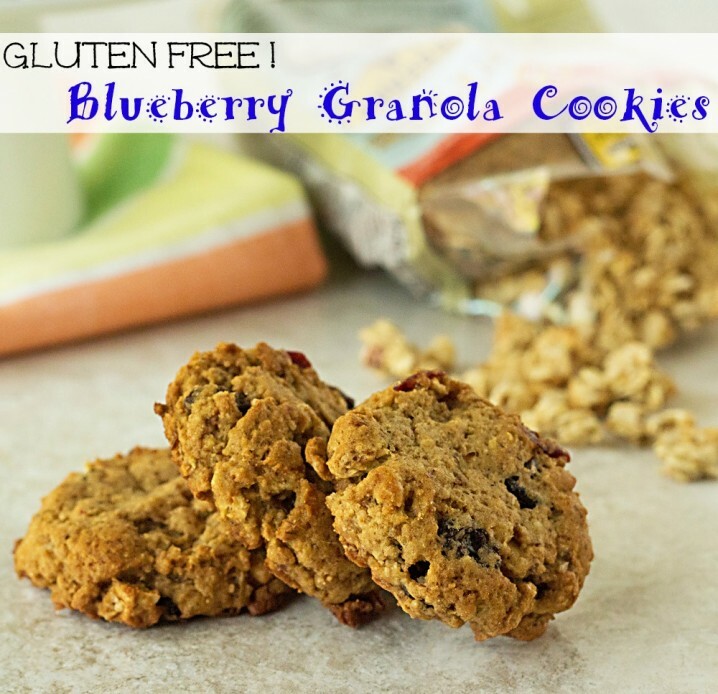 While most of the ingredients in these gluten free blueberry oatmeal cookies are gluten free, in order for this scratch recipe to be 100% gluten free, you’ll need to make sure that all of the ingredients you use are gluten free, including the baking soda and brown sugar. Read your labels, because many of them either contain gluten, or they’re manufactured in facilities where gluten is also used. Because I didn’t need to be concerned with keeping my batch gluten free, I decided to keep my version low carb, by using my favorite low carb baking mix, which is also made by Bob’s Red Mill. 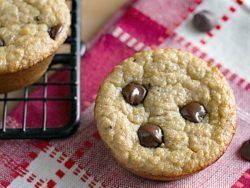 I’ve used the low carb baking mix in everything from low carb banana bread bites to double chocolate peanut butter oatmeal cookies and even pumpkin pie bars! To make things easiest for those of you who don’t have issues with gluten or with carbs, I’m providing a recipe that’s all-purpose, meaning, it calls for ordinary baking products. If you want to make the recipe low carb, substitute low carb baking mix in a 1-to-1 ratio for the all-purpose flour listed in my recipe. They sound delicious Becca! I love adding blueberries to stuff. These could easily go down for breakfast here. Thanks, Melanie! I hope you have a great week! I love that these are gluten free! I have to search to find good stuff for my daughter. I’m so glad you found the recipe to be helpful, Cassie. Thanks so much for stopping by! Nothing better than homemade oatmeal cookies! 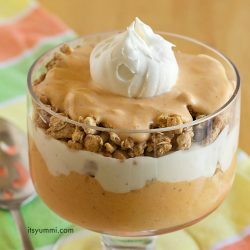 And adding the blueberry apple granola makes these some show stoppers!!! What a great option for kids who are gluten intolerant. Bet they taste great! these look so YUM! will try for sure! How did I know you love blueberries and granola?! I guess I’m a good guesser! 🙂 Thanks so much for comin’ by! I’m so glad you posted this. I just had a friend tell me that she found out her son has an intolerance to gluten and wanted to know if I had any gluten free recipes. Because I neither have Celiac nor an intolerance to gluten either, I don’t cook or bake gluten free. I’m going to tell her to check this recipe out. I LOVE hearing that my recipes might be helpful to people. Thanks so much for your support, Karen. It means a lot to me!